Egypt’s President Abdel-Fattah El-Sisi signed on Thursday several MoUs with Alassane Ouattara, the president of the Ivory Coast, on cooperation in health, culture and information technology. 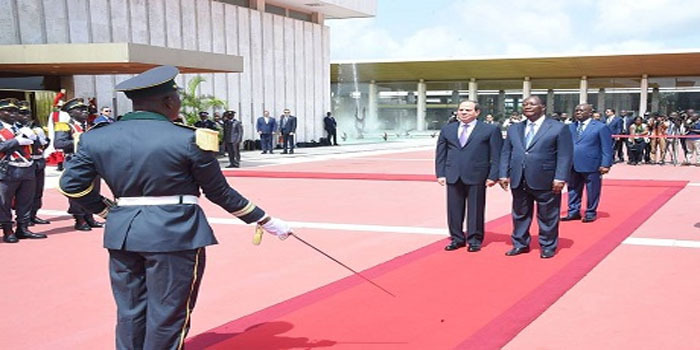 The Ivorian president welcomed the El-Sisi’s unprecedented visit to Abidjan, and expressed appreciation for the Egyptian president’s ongoing African tour, which reflects Egypt’s weight and role on the popular and official levels and its vital role in Africa. President Ouattara also affirmed the strong relations binding Egypt and the Ivory Coast and expressed his country’s aspiration to strengthen relations with Egypt, particularly in the field of information technology, as well as on the economic level. Ouattara said he hopes the Egyptian president’s visit will open new horizons of cooperation between Egypt and the Ivory Coast, especially during Egypt’s current chairmanship of the African Union. President El-Sisi expressed his readiness to support the Ivory Coast in infrastructure and information technology, especially given Egypt’s extensive expertise in these fields. “The talks between presidents El-Sisi and Ouattara reflected strong agreement between the two countries on issues of mutual interest, especially on the situation in Libya,” a statement by Egypt’s presidential spokesperson Bassam Rady said. President Ouattara expressed appreciation for Egypt’s efforts to promote joint African action within the framework of its current chairmanship of the African Union and as part of its mission to promote the AU’s 2063 agenda for sustainable development in Africa.